Bake the Parmesan Chicken according to package directions. Once the chicken cools slightly, dice the chicken, dice the ciabatta roll into similar size pieces and blend these items with the egg, milk, mozzarella and salt. Let the mixture sit for 15 to 20 minutes then divide it into 8 equal appetizer size portions. Form the chicken mixture portions into patties and place on a platter. Heat a small amount of vegetable oil or olive oil in skillet on medium heat. Place the patties, 4 at a time, in the pan and cook for 2-3 minutes on the first side, turn and continue to cook on the other side for 2-3 minutes or until heated through. 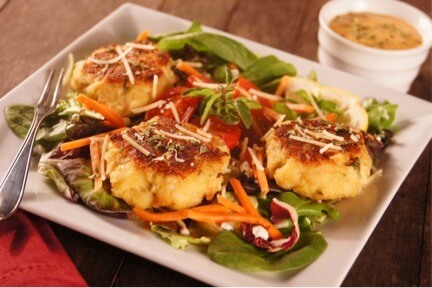 Serve as an appetizer on top of chopped greens, shredded carrots, crumbled chevre goat cheese and creamy parmesan dressing. 1 ea. Ciabatta Roll – 2 oz.